Transparency Market Research (TMR) delivers key insights on the global high barrier packaging films market in its published report titled “Global High barrier Packaging Films Market Forecast, Global Industry Analysis, 2013-2017, and Opportunity Assessment, 2018-2028”. In terms of revenue, the global high barrier packaging films market is estimated to grow at a CAGR of 7.8% during the forecast period, owing to numerous factors on which TMR sheds light in this report. The Asia Pacific excluding Japan (APEJ) high barrier packaging films market is expected to remain in the leading position during the forecast period. High barrier packaging films are defined as films that have a thickness of more than 25 µm. High barrier packaging films physically restrict the passage of any molecules or compounds. High barrier packaging films provides protection from oxygen and moisture. There are certain factors which fuel the growth of the global high barrier packaging films such as it uses modified atmosphere packaging which enhances the shelf life of packaged product. 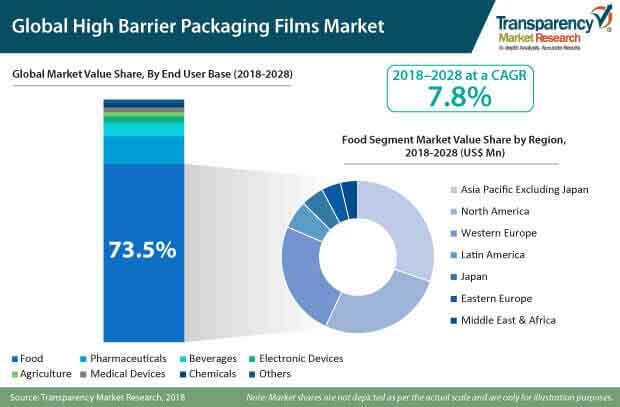 In this report, Transparency Market Research suggests that the high barrier packaging films will play a major role in the food industry during the forecast period. Additionally, high barrier packaging films extend the shelf life of fresh produce packed by controlling the moisture content. Technological development in packaging has enabled new and convenient flexible packaging options such as retort pouches. Electronic devices require flexible high barrier packaging films for protecting them from static electricity and UV rays. The staggering growth of the electronic market is fuelling the demand for high barrier packaging films. Emerging economies in the APEJ region such as India & China, are expected to contribute the major market value share of the global high barrier packaging films market. China is expected to dominate the APEJ high barrier packaging films market owing to growing demand for extended shelf life packaging products during the forecast period. Furthermore, China high barrier packaging films market has witnessed rapid growth in the past couple of decades. The companies involved in the manufacturing of high barrier packaging films are focusing on enhancing their production capacity by establishing new production units. Manufacturers of high barrier packaging films are likely to eye the lucrative regions of Asia Pacific, as well as North America regions in the coming years. Some of the key drivers for the growth of the global high barrier packaging films market include growing demand from the food industry for packaging of fresh produce items. Growing easy convenience of high barrier packaging films with the demand for packaged food is among the fastest growing factors for food and beverage industry in APEJ region. Revenue from the high barrier packaging films market in North America is estimated to account for over 26.6% of the global high barrier packaging films market revenue in 2018. Key players considered in this report on the global high barrier packaging films market include Amcor Limited, Bemis Company, Inc, Uflex Ltd, Sealed Air Corporation, Glenroy, Inc, Celplast Metallized Products Ltd, Winpak Ltd., The Mondi Group plc., Toray Plastics (America), Inc., Berry Global Group Inc.:, LINPAC Packaging Limited, Schur Flexibles Holding GesmbH, Huhtamaki Oyj, Ampac Holdings LLC. :, Bischof & Klein GmbH & Co. KG, Plastissimo Film Co., Ltd., DUNMORE Corporation, Polyplex Corporation Limited, Shrinath Rotopack Pvt Ltd, and ACG Worldwide Private Limited. Key resin manufacturers operating in the global high barrier packaging films market include Exxon Mobil Corp, Mitsubishi Chemical Holdings Group, Kuraray Co Ltd, LyondellBasell Industries N.V, LG Chem Ltd., United Co Rusal PLC, Alcoa Corporation, BASF SE, Saudi Arabia Basic Industries Corporation (SABIC), and Chevron Phillips Chemical Company LLC. Key end-users operating in the global high barrier packaging films market include Nestlé S.A, Tyson Foods, Inc, PepsiCo, Inc., The Procter & Gamble Company, JBS SA, Danone SA, Mondelez International, Inc., Johnson & Johnson, Unilever Plc., and Cargill Incorporated.